Notables: Summer Sweets, Cherry Berry and Fruit Salad, atrio of fun, bright summer-appropriate glitters in clear base that look cute over white polish. 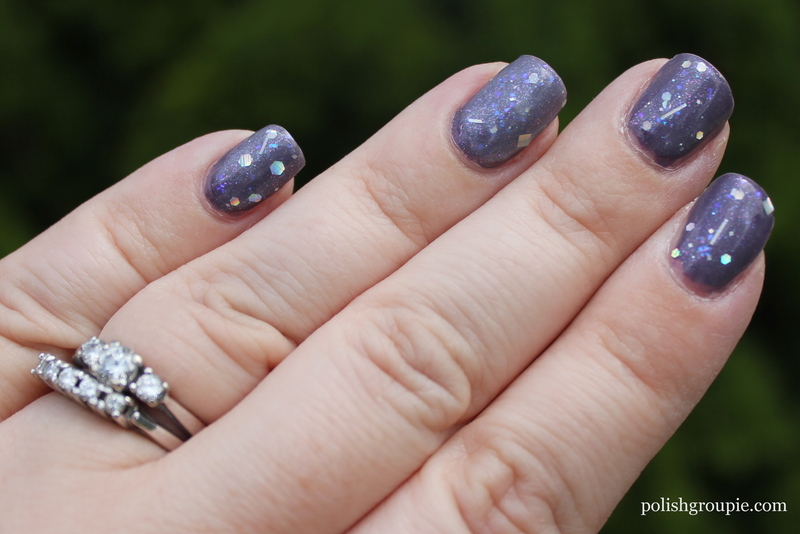 Notables: She’s promising two to four new polishes, plus six re-releases. Details still to come. 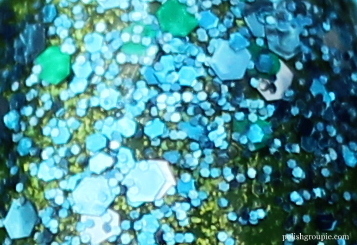 Harlow & Co. is planning to restock KBShimmer sometime this week, though there might be a delay due to some bottle breakage. It’s not lost on me that this is my 13th post, as this was one unlucky manicure. 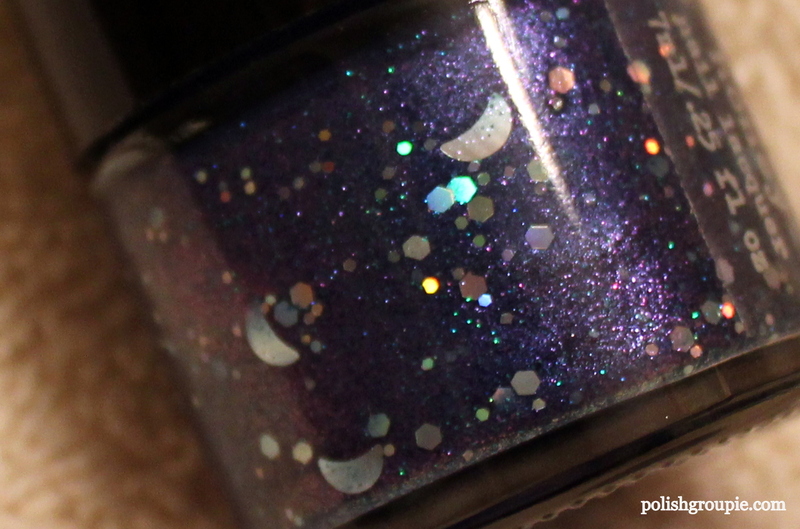 It features Rainbow Honey’s Mare Of The Moon, which is a beautiful purplish-blue color shifter that has shimmer plus silver crescent moon glitter. 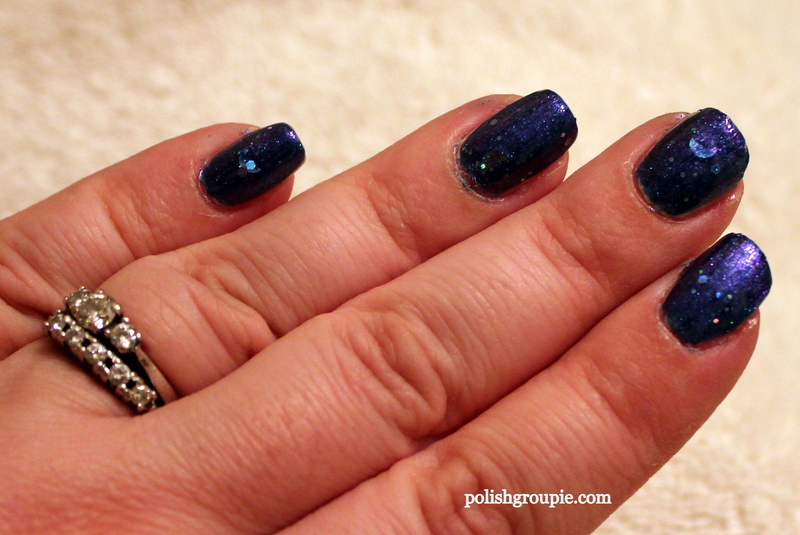 I have been lusting after a blue polish with moon glitter ever since I first saw Windestine’s Spica featured on a blog two months ago (it’s on my lemmings list). So when I saw Mare Of The Moon, part of Rainbow Honey’s Equestria collection, I had to have it. Let me just say off the top that I love the color of this polish. It really is a beauty. 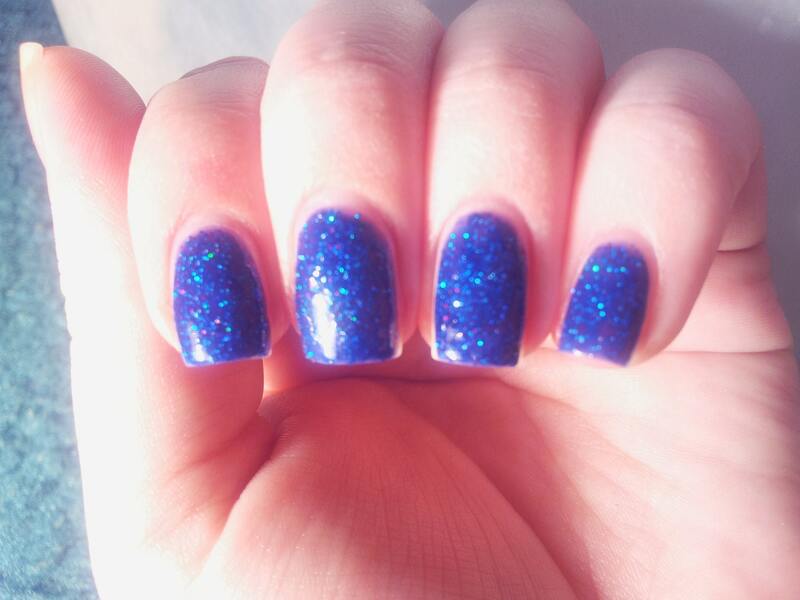 And despite what’s to follow, I really enjoyed wearing this polish. Can’t take my eyes off of it. But here’s where we get into the “unlucky” part of this manicure. I had a terrible time with the application. Part of my problem was definitely that this was a mini (7ml) bottle, and I found the short brush challenging to work with and the large top a bit awkward to hold. With my painting hand being so close to my “being painted” hand, it was difficult for me to maneuver the brush the way I wanted, and to see what was going on. Maybe this is just the danger of the mini bottle. I admit, I haven’t purchased that many. Will definitely pause next time I’m tempted to buy one. That said, I applied undies on this which was also a mini bottle, and I didn’t have nearly the trouble applying that one. More on the undies later. 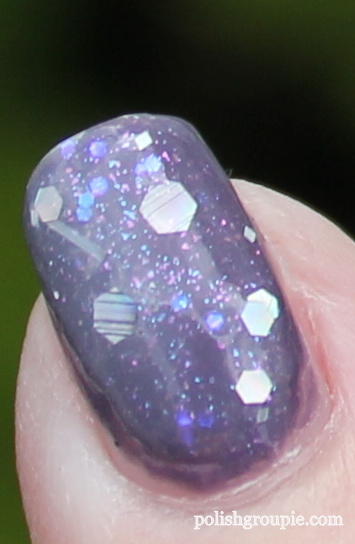 The rest of my application problems I think had to do with the polish itself. It can be quite thin and watery, almost like water color if you don’t load the brush enough. I didn’t mind that as much as I did the drying time. It seemed to dry very quickly; before I had even finished painting a nail, that nail had already begun to set. Plus it has what I would call just shy of a matte finish. 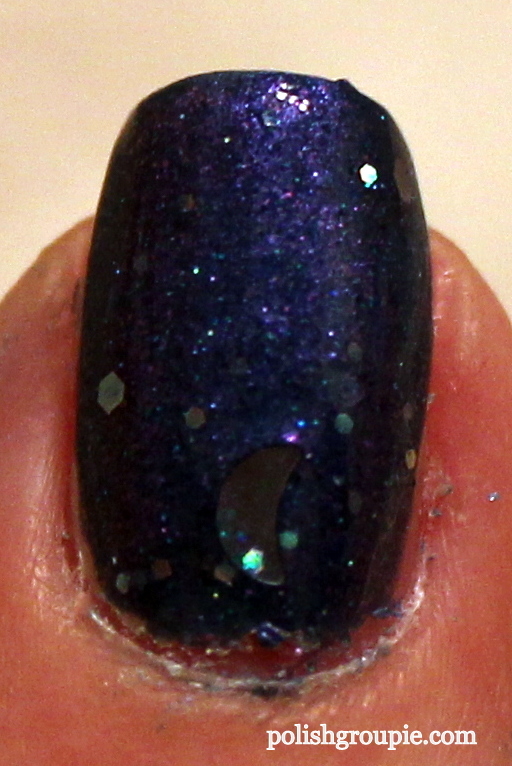 That was a disaster given that I had to fish out and try to place the moon glitter, which for me was the main attraction of this polish. 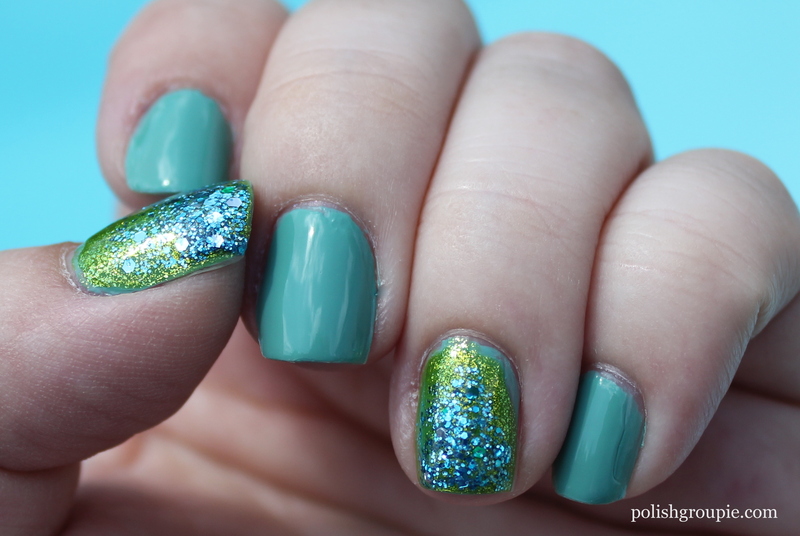 As I’d try to move the glitter or even transfer it from the brush to my nail, i was disrupting the parts of the polish that had already begun setting. It made for a very uneven, bumpy and frankly not very attractive end result, though adding topcoat helped smooth things out. The final nail in the coffin here is that I cannot find my cleanup brush, which I desperately needed on this one. I did what I could with an orange stick dipped in acetone. For undies I used one coat of Mattese Elite’s Up My Platinum, available from Ricky’s NYC. I probably didn’t need it, but I didn’t want to risk it. Up My Platinum is a frosty silver that went on pretty smoothly. Formula was quite nice. Here it is on its own with a top coat. 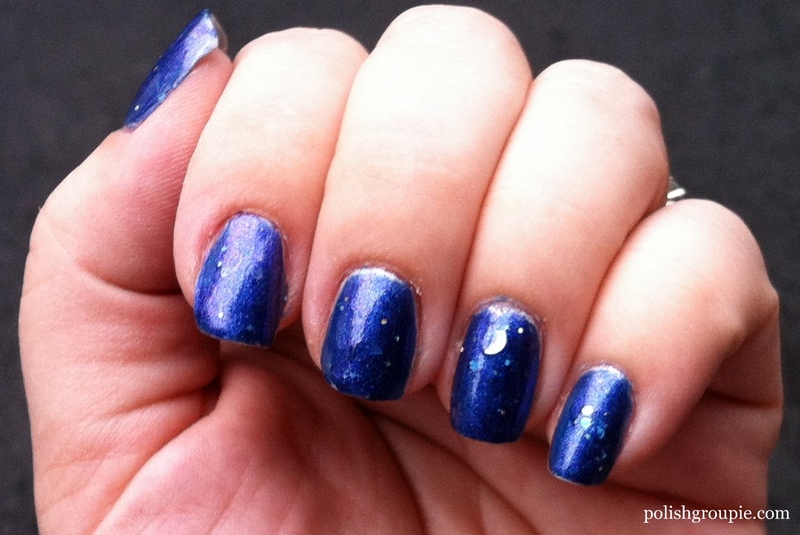 I followed that with two coats of Mare Of The Moon and a coat of Poshe. I will definitely try this one out again when I have all my ducks in a row and am feeling at the top of my game. Now that I’m more familiar with the formula, I think I could do a better job of wrangling it. Mare of the Moon is available from RainbowHoney.com. Currently the minis are in stock but the full size is not. 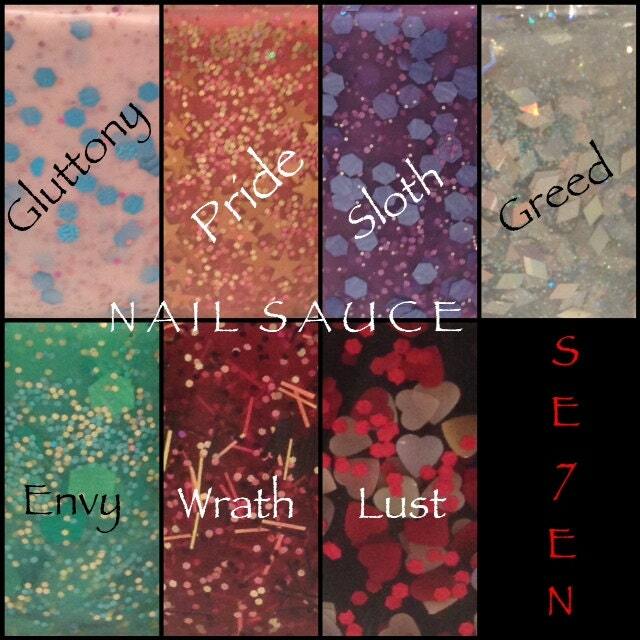 Rainbow Honey’s polishes are 3-free, as are Mattese Elite’s. 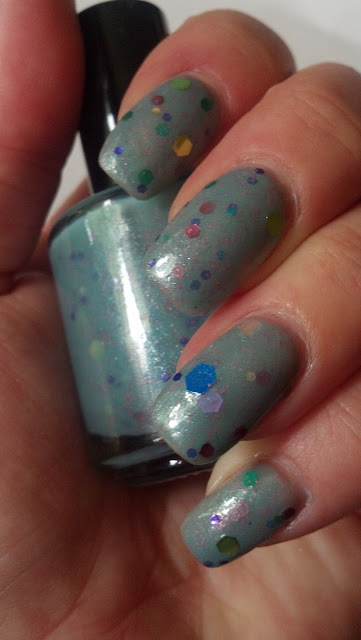 I recently nabbed a new indie, Pahlish’s Your Silver Lining, and have been dying to try it out. I bought it earlier this month at the end of a crap day not only because I liked it very much but also because I took some higher meaning from the name since I was at that very moment trying to find some silver lining in the midst of a bad situation. It felt like kismet. 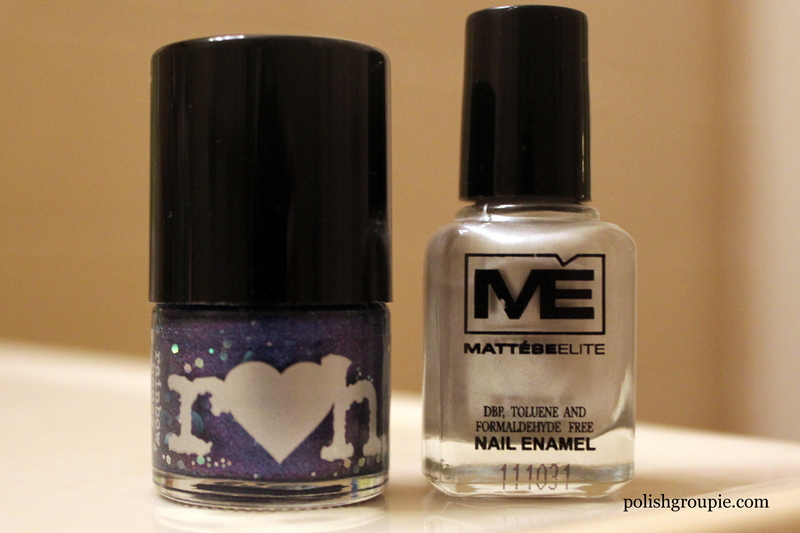 Your Silver Lining is a shimmery, sheer, milky white polish with small holographic hex, square and bar glitter. 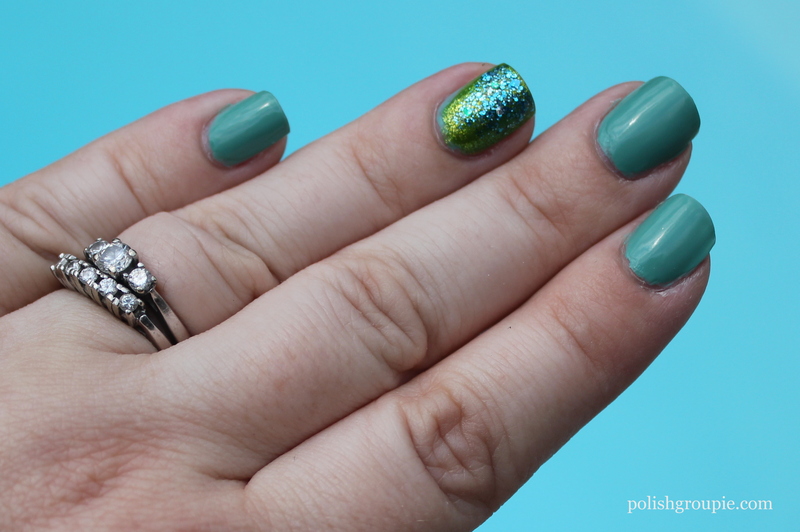 I paired it with another new-to-me shade, Lotus, from Zoya’s True Spring 2012 collection. Zoya describes it as a “dusty blue-toned amethyst purple with colorful shimmer that reflects pink, red and gold.” I’d say that’s a dead-on description. The application on Zoya Lotus started out nice, but I swear that it got goopier as I went along, so it was a little challenging for me. This was a brand new bottle, first use. 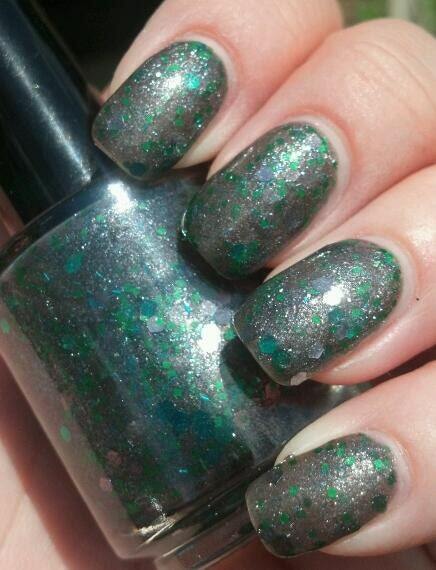 Still, I love this color; it has a lot of depth to it and isn’t a bright in-your-face purple. Your Silver Lining is a great shade for layering, but it did take a few tries to figure out how much I needed on the brush for optimal application. I had to fish around and dab to find and place the glitter where I wanted. As a result I ended up with much thicker coats than I intended on some nails, but I got better at it. You can see that my ring finger looks milkier than my middle finger. The (male) trainer at my gym described this manicure as “whimsical but elegant.” I thought that was pretty funny, but I think it is an apt description. Pahlish is scheduled to launch today at Llarowe at 3pmET and again at 9pmET, so you might be able to grab Your Silver Lining there. Pahlish also has a shop on Etsy. 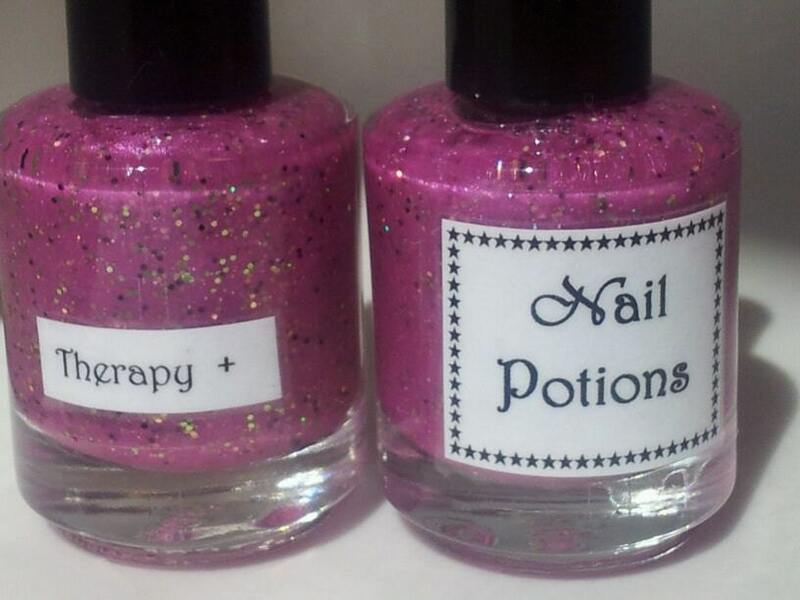 What nail polishes have you purchased recently more because of the name than the color? Due to power outages, Pretty & Polished’s restock has been rescheduled for Wednesday, July 25 at 8pmET.